An official report released on Thursday warned that the Israeli schemes to be implemented in Sheikh Jarrah neighborhood in Occupied Jerusalem threaten the Palestinian presence there. 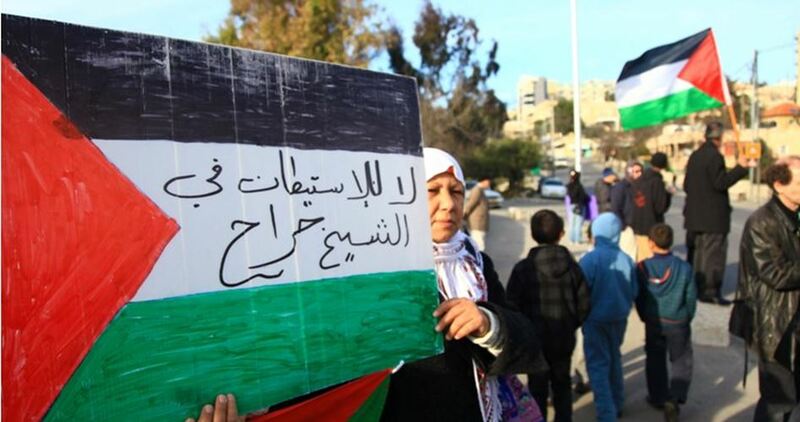 The report issued by the PLO Negotiations Affairs Department and entitled “Forced displacement of the residents of Sheikh Jarrah” explained that Israeli authorities force Palestinian families in the neighborhood to evacuate their homes. Located to the north of the Old City of Jerusalem, Sheikh Jarrah is home to about 3,000 Palestinian citizens and some important organizations including Beit al-Sharq, the PLO headquarters which was closed by Israeli authorities in 2003, the Palestinian National Theater, and a number of headquarters of diplomatic missions. According to the report, Israeli authorities often force Palestinian families to evacuate their homes late at night to intimidate and terrorize the inhabitants. The International Criminal Court considers forced displacement a war crime and a crime against humanity especially when it is carried out in a widespread and systematic manner against civilians. 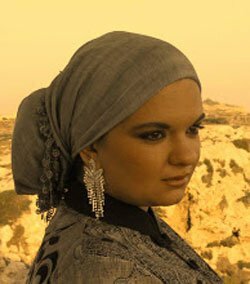 The report noted that the Israeli seizure of Palestinian property and settlers’ harassment of Palestinians on a daily basis contribute to the creation of a scenario similar to that in al-Khalil where a small number of settlers control the movement of the bigger majority of the Palestinian population. It explained that the Israeli policies pursued in Occupied Jerusalem have emerged since 1967 based on two central strategies: the first is to establish a Jewish majority in the city by building Jewish-only settlements, while the second seeks to achieve the same goal by limiting the Palestinian population growth through policies aimed at expelling Palestinians from Jerusalem or obstructing the development of the Palestinian society. These strategies, the report underlined, include a spatial separation policy which goal is to isolate neighborhoods from one another and thus weaken the Palestinian presence in the city. As part of the first strategy, Israeli authorities, in cooperation with settlement associations, work to establish settlement outposts in strategic areas in the Arab neighborhoods of Jerusalem, particularly Sheikh Jarrah neighborhood in an attempt to create geographical communication between West Jerusalem and the Hebrew University in East Jerusalem. 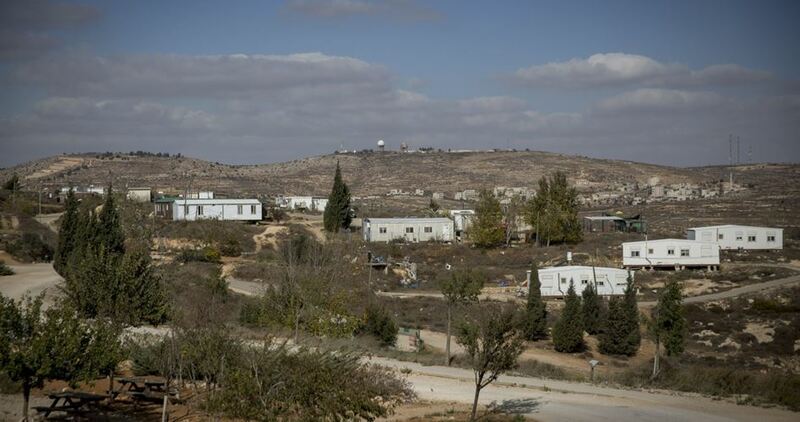 The report stressed that these settlement outposts, which are inhabited by extremist Jewish groups, are illegal under international law. The fact that an obnoxious, racist and sexist columnist wrote something for the Sunday Times is not exactly news. Last month, though, one of them, Kevin Myers, came out with something that caused such an online backlash that he ended up losing his cushy little gig there. In doing so, Myers invoked – no doubt deliberately, in order to stoke that most tedious form of unit-shifting, “controversy” – one of the oldest anti-Semitic stereotypes of all: that of the money-grabbing Jew. Myers no doubt saw no problem in such a disgustingly dehumanising statement, having being enabled over the years by his editors at various papers, who have allowed him to publish articles with such charming titles as “There was no holocaust” and “Africa is giving nothing to anyone – apart from AIDS”. As I say, Myers ended up losing his column with the Sunday Times. The paper’s editors said he would never write for them again. Enquiring minds might ask which of those editors approved the column in the first place. However, Myers did have a few people springing to his defence, despite his anti-Semitism. With a predictability that has become routine for those of us who follow these things, he was defended by some Zionists on the perverse basis that he could not be anti-Semitic because he is a supporter of Israel. This is a complete fallacy, but still common. 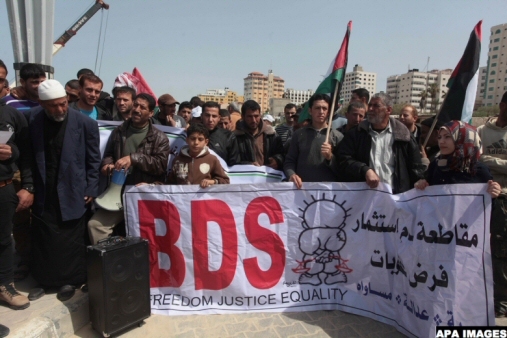 Jews who support Palestinian rights, and are active in the solidarity movement, are routinely abused in the most appallingly anti-Semitic terms, by Zionists. They are called “court Jews” and “Kapos” (rather like saying that they are “Uncle Toms”); or even wished “back into the ovens”, or that “Hitler had finished you off.” All this disgusting stuff is fairly routine from Zionists. And it goes right to the top too. Israeli Prime Minister Benjamin Netanyahu recently appeared via video link at the conference of Christians United for Israel. There, he preened over its leader and founder Pastor John Hagee, one of America’s most vile anti-Semites. However, because of Hagee’s role in rallying the US evangelical right-wing’s support for Israel, Netanyahu called him his “long-standing friend… through thick or thin” and hailed the role of CUFI. Hagee once preached in a sermon that “Hitler was a hunter” sent by God, and that the Holocaust was divinely ordained to chase the Jews “back to the land of Israel.” Vicious stuff, but perfectly in tune with Zionism. For too long Zionists have been able to get away with this kind of poison, even while having the chutzpah to accuse all critics of Israeli war crimes and apartheid of anti-Semitism at every turn. It’s time to start pushing back. HEBRON (Ma’an) — A group of Israeli settlers from the infamously extremist Kiryat Arba settlement in the southern occupied West Bank threw rocks at several Palestinian homes in Hebron city on Friday night — the latest in a marked increase of settler attacks on Palestinians in the district. Jamal Seifan, a resident of the area, said that Israeli settlers threw rocks at his house and houses belonging to Said Daana, Jamil Seifan, and Abd al-Hay Seifan. Seifin added that rock-throwing at Palestinian homes and assaults committed by settlers on Palestinians in the neighborhoods of Jaber, Wadi al-Nasara, and al-Salaymeh in Hebron city have seen a sharp increase in recent weeks, particularly on Fridays and Saturdays during Shabbat. The attacks, Seifin said, were all carried out “under the eyes of the Israeli police and soldiers,” who have consistently failed to protect the local Palestinians. Between 500,000 and 600,000 Israelis live in Jewish-only settlements across the occupied West Bank, including East Jerusalem, in violation of international law. According to UN documentation, there were a total of 107 reported settler attacks against Palestinians and their properties in the West Bank, including East Jerusalem, in 2016, with 81 attacks being reported since the beginning of 2017. BETHLEHEM (Ma’an) — Israeli border police shot and killed a Palestinian teenager at Israel’s Zaatara military checkpoint in the northern occupied West Bank on Saturday afternoon, with Israeli authorities alleging the youth attempted to carry out a knife attack on Israeli forces when he was shot. While initial reports suggested that an 18-year-old Israeli soldier was lightly injured after being stabbed by the Palestinian, Israeli police spokeswoman Luba al-Samri later said that the border police officer was in fact lightly wounded by friendly fire. Israel’s emergency medical service Magen David Adom reported that the MDA and Israeli army medics treated the Israeli soldier, an 18-year-old male who was in a mild condition. The youth then allegedly brandished a knife “and started to battle an officer before other officers fired at him and neutralized him, and he was announced dead on the scene.” She released a statement shortly after saying the Palestinian was still alive but in a critical condition. Minutes later, a further statement confirmed he had succumbed to his injuries. The Israeli police spokeswoman also provided a photo of the knife allegedly found on the youth, identified by local sources as Qutayba Yousif Zahran from Illar village in the Tulkarem district. “A border guard police officer was taken to a hospital after he was hit by shrapnel in the foot,” al-Samri said, presumably referring to Israeli friendly fire. An eyewitness told Ma’an that a large number of Israeli soldiers arrived to the scene and closed the checkpoint, denying passage to Palestinians in either direction. 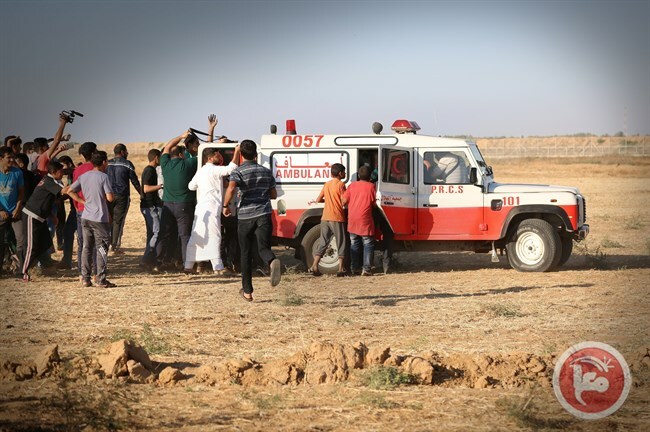 BETHLEHEM (Ma’an) — An unidentified Palestinian “youth” was shot in the chest by Israeli forces with live ammunition near the Israeli-Gaza border on Friday, according to local sources. According to locals in Gaza, Israeli forces stationed at military watchtowers on the border line east of Jabaliya in the northern Gaza Strip opened fire at a group of Palestinian youths “as they approached the border fence,” causing the injury of one youth in his chest with a live bullet. The injured youth was transferred to the Indonesian hospital in Beit Lahiya, where he was reportedly stabilized. Sources added that Israeli forces fired tear gas canisters at the youths as well. Clashes also erupted in several other areas of the Gaza Strip, with locals reporting clashes near the Nahal Oz military post near northern Gaza, east of al-Bureij refugee camp in central Gaza, and east of Khan Yunis and Rafah in the southern Gaza Strip. Israeli forces fired live ammunition and tear gas canisters at Palestinians in all locations, according to locals. “In response to these riots, soldiers fired selectively to main instigators,” the spokesperson said, adding that the army was “aware of reports” of one injury. A 16-year-old Palestinian was killed in June by Israeli forces during clashes along the border east of the Bureij refugee camp during clashes that injured at least seven Palestinians, four of whom were injured with live ammunition. The video was published on Sunday by the human rights group B’Tselem, along with a harrowing report on the 21 July Israeli raid. “Words fail to convey the gravity of the police’s conduct inside the hospital,” B’Tselem said, according to Days of Palestine. The Israelis kicked people out of the blood bank, where dozens of volunteers were trying to donate desperately needed blood. They raided the maternity ward, including a room where a mother was present, and sprayed pepper spray into another that was empty. Staff gathered most of the mothers in one room and took their babies to the nursery to protect them. Israeli forces stood around him for five to 10 minutes without providing any medical assistance, according to B’Tselem. Then, when a Red Crescent ambulance arrived, Israeli forces tried to obstruct it. 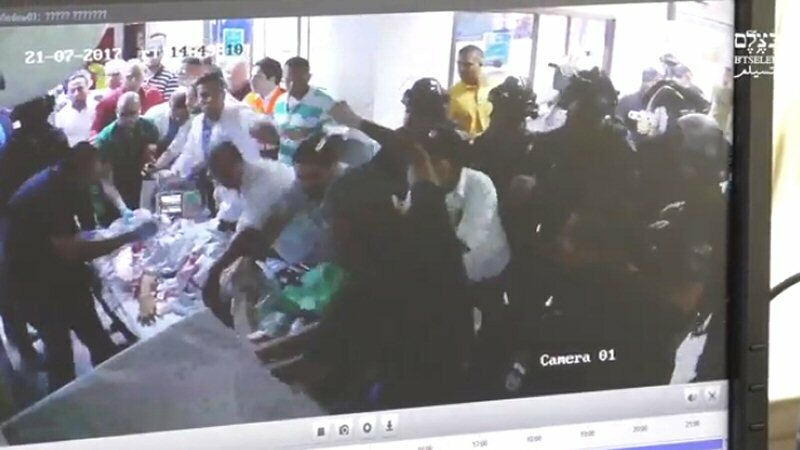 But, the paramedics were able to reach Abu Ghanam and get him into the ambulance – which one of the Israeli soldiers tried to get into as well. But, for all the efforts of the medical staff, they could not save Abu Ghanam’s life. After he died, Palestinians managed to smuggle him out of the hospitall and take him for immediate burial, to avoid Israeli forces confiscating his body – a frequent form of collective punishment. Two Israeli settlers attacked, on Thursday, a Palestinian bus driver near the Bat Ayin settlement, in Gush Etzion settlement bloc, southwest of Bethlehem. Israel’s Channel 7 said, according to the PNN, that the settlers assaulted the Palestinian driver, sprayed him with pepper spray, beat him and tried to damage his car, after they confirmed he was an Arab. 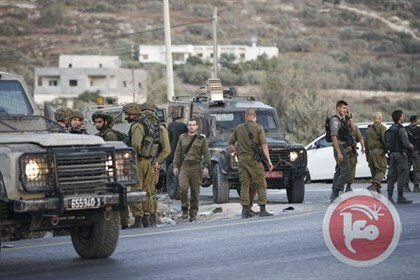 According to the channel, the settlers approached the driver who was standing by his vehicle away from the settlement. The settlers started conversing with him to make sure that he was an Arab, then they sprayed pepper and attacked him, before finally fleeing the scene. Israeli police claimed that they opened an investigation into the incident, and that they have detained the settlers, whom they said reported were 15 years old. Latin America is once again Israeli Prime Minister Benjamin Netanyahu’s diplomatic target, at a time when violence in the region fomented by US imperialism is once again rising to the fore. Coinciding with the 70th anniversary of the UN Partition Plan, Netanyahu is planning to visit Mexico and Argentina before addressing the UN General Assembly next month. Support for the Partition Plan from other countries, however, still forms a premise for Netanyahu. At a time when political violence is threatening to engulf the region, it comes as little surprise that Netanyahu has envisaged the possibilities of exerting additional influence. In 2014, while still Mayor of Buenos Aires, Mauricio Macri, now president of Argentina, travelled to Israel for a conference during which he stated: “Israeli suffering has to be understood. From afar it’s easy to give advice, but you have to be in Israel to really understand the situation.” The comments should not come as a surprise from Macri, who last year angered Argentinian victims of the Videla dictatorship by refusing to acknowledge the thousands of murdered and disappeared civilians. Israel has a wall and everyone said do not build a wall, walls do not work – 99.9 per cent of people trying to come across that wall cannot get across and more. Bibi Netanyahu told me the wall works. The region’s ties with Israel cannot be disputed particularly at a time when Latin America was colonised, plundered and exploited by the US. Some countries have remained staunch allies of Israel and the US due to their political allegiances which have not changed. Guatemala’s support for the partition of Palestine and its lobbying to enable the passing of the resolution is one such instance and its support for Israel remains referenced to earlier historical ties. Chile under Augusto Pinochet also sustained ties with Israel: repression, surveillance, murder and disappearance of civilians constituting a common ground for the colonial entity and the dictator. Cuba, Venezuela and Bolivia have, in the past years, been the staunchest supporters of Palestine. The deaths of Hugo Chavez and Fidel Castro have left a political void that is hard to emulate. However, both countries’ experience of US imperialism has instilled in the people an internationalist approach – one that has the potential to lead if other countries follow suit. Brazil’s refusal to accept settler leader Dani Dayan as ambassador last year was step in the right direction – Netanyahu’s efforts to promote settler colonialism through a settler leader advocating for expansion failed. However, Latin American countries must also shoulder responsibility for consistency when it comes to supporting Palestine and its struggle against colonisation. If Netanyahu’s plans are to be thwarted, Latin American countries must develop a narrative of Palestinian support away from the two-state compromise. In doing so, Netanyahu’s claims of a region friendly towards Israel can be dispelled and Palestinian internationalist support will benefit from a new approach – that of former victims of colonial and neoliberal violence uniting and challenging the passive acceptance of Israel at an international level. Israeli Prime Minister’s Office is seeking to increase by tens of millions of shekels the budget for evacuating and resettling residents of the illegal West Bank outpost of Amona, according to Haaretz Hebrew newspaper. 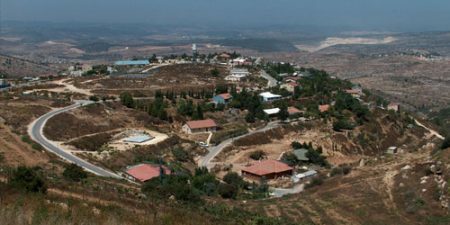 It asked the Finance Ministry this week for a further 30-70 million shekels ($8.25-$19.25 million) on top of what is already allocated to develop Amichai, the new settlement for those being moved from Amona. Haaretz has learned that if the requested increase is paid fully, the state will have invested close to a quarter of a billion shekels to evacuate and resettle 40 families who had built homes without permits and against the law in Amona. A spokesman for the Prime Minister’s Office denied this report, but four sources familiar with the matter have confirmed it. The sources said the prime minister’s chief of staff, Yoav Horowitz, asked for the added sum at a meeting this week with officials from several ministries involved in building the new settlement. The meeting was held due to the halt in the new settlement’s construction, caused by the lack of funds which none of the ministries was willing to pay. Until now some 160 million shekels were earmarked for Amona’s evacuation and building Amichai. The sum consists of about 60 million shekels for infrastructure and public structures, 40 million shekels to compensate the evacuated Amona settlers.